I've come to terms with the fact that there's probably never going to be another Bubsy game. That won't break too many hearts, but what happens when we're faced with the potential "death" of a widely loved series like Final Fantasy? Chris Kohler made such a suggestion and was greeted by more than a few irritated fans. We took his articles and analysis as an opportunity to discuss Final Fantasy and whether a few other high-profile franchises have shuffled off this mortal coil. If you have thoughts on a series that isn't long for this world or one that is primed and ready to rise from the ashes, jump into the comments! I gotta say, I had trouble disagreeing with Kohler about Final Fantasy. I do feel like there's a point in the series you can point to, and say, "That's when one series ended, and another, pretty distinct series began", being when Sakaguchi left the series, after Final Fantasy IX. That's not to say the later games were all bad, but they don't really feel like Final Fantasy games to me. Do either of you know the history about what happened with Sakaguchi and Final Fantasy IX? Because it's interesting, and really changes my view of that game, turning it into a kind-of swan song (swan game?). As far as death, in the way of this slow petering out that Final Fantasy has been going through, I'd have pointed to Tomb Raider until earlier this year. So, I don't know, maybe there's hope in that example. King's Quest also had a rough few years there. Er - I just realized that I really ought to have listened, before posting. Sorry if you guys discussed any of this. I don't agree with the Silent Hill series being dead. I think there is a difference between a series really being dead or the fans just acting like it was. For me (as a huge fan of the entire series) Downpour was my favorite game of last year. I know it's just an opinion but I'm glad that the series is actually still alive as one of the last horror franchises that still does new things and hasn't become a pure action shooter. People need to stop comparing every new entry in the series with Silent Hill 2. From a gameplay perspective I actually think, that Downpour does so many things better, even though it has some technical issues. Is Age of Empires dead? I think there was an online one awhile ago but I don't remember playing it. There must be other RTS franchises that have faded into the Nothing. Classic RTS Warcraft? I don't see Blizzard bringing that one back after WOW, but I guess the franchise itself is still alive relatively healthy still. Though WOW is like the grandpa of videogames that people are still playing. Another classic JRPG I can think of is Phantasy Star, but again I think there is an MMO now. Does it count as dead if you totally change what it was? Or, even older, what ever happened to those adventure King's Quest games from yesteryears. I am pretty sure that series is dead. I may also add all those other Sim games that weren't Simcity and the Sims. I don't see Simfarm or Simant sequels coming out soon. Does that count as dead? Or has the Sim series just slimmed down and become more lean. hmm there must be more. Perfect Dark? Did you guys already say that one? Suikoden is a series that seems to be all but dead as well. Ever since the third entry in 2002, the franchise began to waver and now it is totally out of the JRPG spotlight. Uncoincidentally, 2002 was when the series' initial creator left Konami. I feel that FF truly changed for the worst after Sakaguchi left Square. Even in his executive roles, he infused a specific charm and 'lightness' to the series which kept it compelling but not too wrapped up in itself. His recent titles at Mistwalker (Lost Odyssey and The Last Story) are the true FF successors, in my opinion. Death should be something we respect in a series. I don't think it tragic as much as I think it Ideal. A right conclusion and an impact on the industry at large is the best thing you could hope for a game series. Or any work of art, for that matter. But just like we can talk about a games death, we can also talk about a games children. Take Devil May Cry for example. That series, in it's original conception is dead as a doornail. Sure they rebooted it as DmC, but that's because the original creator went off to Platinum Games to make Bayonetta. It's a case of "the king is dead, long live the king." DMC had two children, one inherited its face, the other it's heart. And that's not even mentioning its illegitimate child, God of War. I have respect for the ancestor games, the Resident Evil 4's, Devil May Cry's, and Final Fantasies. But I wish we could recognize their spirit (or very often, key creative minds who move on to other projects) in the games that follow them, rather than endlessly try and reanimate something past. All I know is what I gleaned from the FF IX wikipedia entry, but I agree: that game was definitely a send-off to that entire era of FF games. 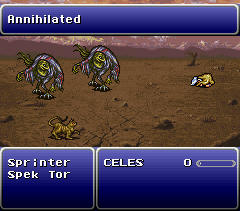 Poignant, like you say, but it still remains one of my favorite FF games. Quite true: one person's death is simply another person's evolution. I am interested in your warm feelings towards Downpour. I played it and found it to be pretty rough, so I'd like to hear your thoughts! A couple of those you mention like WoW and the Sims are interesting because they feel like victims of their own (or their studios') success. Blizzard has no real incentive to kill the golden goose, nor does EA with The Sims, so they just settle into a long-term holding pattern of similar DLC packs and expansions. I never got into the Suikoden series, but the people I know that played JRPGs always held it up as the gold standard. It's a shame that it's gone dormant. Maybe someday when I retire I'll have the time to go through all these JRPGs on my back log. Excellent points; both poetic and true! Getting too hung up on the franchise name, rather than the spirit or the creators that made the series special, is how Final Fantasy got in trouble in the first place.